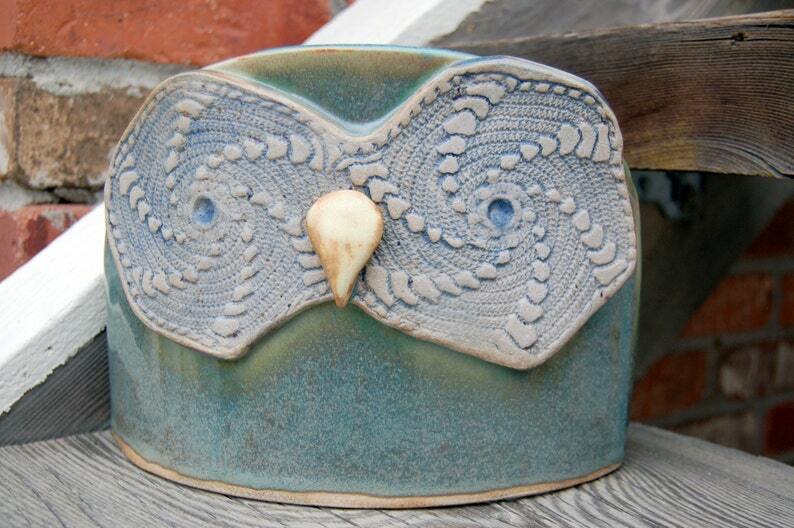 Smooth, serene, and mostly green Zulema is a large ceramic owl sculpture measuring 8.5 inches wide, 6.25 inches tall and 4.75 inches deep. Her body color is comprised of two layered glazes: first an earthy, terra-cotta brown and over that a teal green. The two colors break on the edges of Zulema's body and around her eyes to a much lighter sea foam green, all high gloss. Her beak is a toasted yellow matte finish glaze. Her eyes were left unglazed but were coated in a blue slip prior to the bisque (or first) fire. She is a sturdy gal and would look great in a variety of decor.